Competition: WIN! 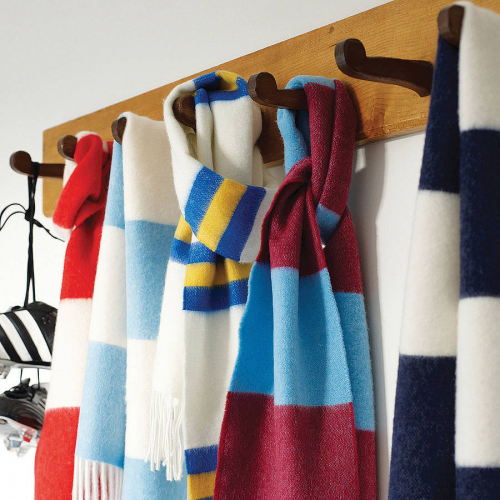 Luxurious Savile Rogue Cashmere Football Scarf In Your Club Colours! As mean ol’ winter rolls in across the land, Pies have once again cosied up to our distinguished pals over at Savile Rogue to give you the chance to win one of their luxurious cashmere football scarves in the club colours of your choosing. Classically styled as they are, you won’t find any naff nylon, logos or slogans anywhere near Savile Rogue’s top-tier football scarves. Nay, what you get is a traditional bar design, comfort, warmth and the very finest wool. Pies should know, we’ve got one ourselves. It’s like wearing an angel’s sigh around your neck at games. Q: Which company were Manchester City’s first ever shirt sponsor? Send your answers (just an ‘A’, ‘B’ or ‘C’ will do) to us at waatpies@gmail.com with ‘Savile Rogue Comp’ in the subject field, and we’ll pick a winner from the correct answers at random by the end of the week. Terms & conditions: The closing date is midnight (GMT) on Saturday 17th November, 2012. Only one entry per person. Unfortunately, the competition is open to Pies readers in the UK only. You can follow Savile Rogue on Twitter and/or Facebook.